From the pervading use of digital devices to an accelerated move to cloud computing, the proliferation of new technology in healthcare is exploding. Closely linked to the increasing use of technology in healthcare is the emergence and rise of enterprise streaming video, a modern-day business tool expected to witness an explosive growth across all industries and triple in size by 2021, according to Frost and Sullivan. For healthcare practitioners, the incorporation of enterprise video streaming, everywhere from surgical ORs to a patient’s home, could bring on transformational possibilities to revolutionize healthcare accessibility for patients; knowledge readiness for caregivers; increased collaboration among care teams; and lowered operational expenses for healthcare facilities across the board. Seeing this, the next generation of healthcare services require advanced video streaming technology that is comprehensive, flexible, and scalable enough to support the needs of modern-day caregivers, patients, and families. VIDIZMO, named a challenger in Gartner Magic Quadrant for enterprise video platforms, provides innovative live and on-demand video streaming solutions and digital asset management in a continuous, single platform that reduces technological redundancies in an otherwise vast system of healthcare systems, facilities, and stakeholders. 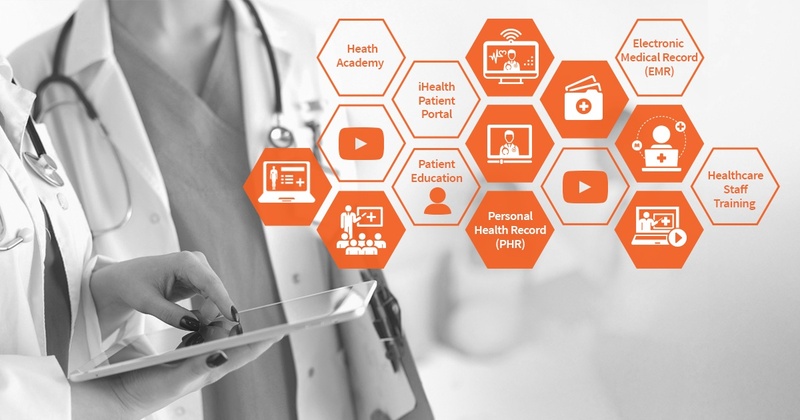 Interactive health records, lectures or presentations: In VIDIZMO Health Academy, all health records can be combined in the form of interactive video content alongside audio, images, flow charts, presentations, SCORM, animations, diagrams, tables, graphs and other digital assets complied into a comprehensive presentation such as a digital case file, available to all physicians and even the patients themselves with complete context for future treatments. Additionally, healthcare professionals can also use such media to deliver live or on-demand video streaming in healthcare presentations or lectures for an engaging audiovisual learning experience. Video capture and storage from any recording device: VIDIZMO Health Academy captures and ingests video and other digital media from any device, in a variety of video file formats, and stores it in a centralized repository for internal and external use. For instance, VIDIZMO can ingest video and digital assets stored on laptops, DVD’s, USBs, streamed content on online platforms, web apps, and much more. VIDIZMO’s healthcare video platform also processes media for playback on all devices in varying bandwidth conditions. Video transcription, indexing and intelligent search: VIDIZMO’s powerful search and indexing capabilities allow a quick and easy search of all videos and digital media files stored in the healthcare video platform. With automated transcription and closed captioning, all spoken words in a video can be indexed to enhance in-video search capabilities. In an intelligent video search, users can look for key phrases spoken within a video while also enabling speaker identification to quickly locate content by the speaker’s name, e.g. searching for videos using a doctor’s name. For added convenience and efficiency, a customized list of relevant or frequently used medical search terms can also automate vocabulary creation for spoken-word tagging. Inter-facility or inter-department file sharing and collaboration: VIDIZMO’s healthcare video platform allows smooth and instantaneous sharing of wide-ranging digital media of all sizes and file types, without bandwidth congestion or network constraints. File sharing can be carried out within a facility’s network or globally, resulting in easier collaboration between care teams, diagnostic departments, external health services partners, or even facilities across the country and in different parts of the world. Patient portal for comprehensive aftercare: VIDIZMO iHealth Patient Portal allows for collaboration between patients and care teams where hospital care staff can either manually assign specific videos to patients or the patient portal can automatically assign media based on patient’s healthcare records in EHR, PHR (Patient Health Records) & other medical reports, while also adjusting periodic changes over time. Following this, the patient can view assigned media or presentations from a consolidated ‘viewing plan’ within the portal. A patient’s viewing activity then generates instant reports that can be monitored by care teams, and a patient’s progress can initiate automatic workflows for further action. Patients and their families are granted external stakeholder access to the portal, which could contain video for recovery and aftercare, preventative care, and even precautionary care for high-risk conditions. The portal can also send alerts or push notifications to patients as reminders to view any pending unwatched videos that were assigned. Integration and compliance with existing healthcare systems: VIDIZMO provides seamless integration with existing patient case management tools such as EHR, EMR, PHR, etc. as well as business applications such as video conferencing tools, LMS or eLearning tools, CMS, CRM, and Office 365, among others – all of which allows full integration of VIDIZMO’s multimedia capabilities with existing healthcare business applications and IT systems. VIDIZMO also offers the ability to publish, embed, import, or export SCORM content from an existing LMS. Detailed viewing analytics and reporting: VIDIZMO contains detailed records of viewing activities for all users accessing the healthcare video platform. In the case of value-based care, for instance, care teams can effectively track patients’ viewing activities to ensure compliance and even determine the correlation between the patient’s health improvement outcomes and their usage of the assigned aftercare or wellness video. Additionally, trainers can use video analytics to ensure all trainees watch the required content to completion. Similarly, authorities responsible for disseminating policy or legislative compliance videos can use analytics to ensure all relevant staff members watch the assigned videos. Also, send/ receive push notifications can be used to inform administrators of user receipt or acknowledgment of assigned or delivered content. Interactive video quizzes, surveys, courses, playlists, etc. : VIDIZMO supports the creation of training courses, playlists or learning plans with multiple media assets such as video, audio, documents, presentations, etc. segregated in chapters for easy navigation when content is assigned collectively to individuals or groups of users. Moreover, VIDIZMO also enables the integration of engaging content such as quizzes, surveys, polls, and other interactive media to support high impact learning. Multiple channels for inter-departmental content segregation: VIDIZMO allows the creation of any number of channels within the healthcare video platform to enable complete user and content segregation between various departments within an institution. Each department can then use their channels independently for departmental use or collectively for organization-wide messaging or communication. Multiple levels of user access, control, and security: By default, every channel within VIDIZMO comes with a set of user roles such as Administrators, Managers, Moderators, Contributors, Viewers/ Learners, which can be assigned to different users with varying levels of access, permissions, and capabilities within the system. For instance, an administrator has the ability to add, delete or change user roles within the platform whereas the contributors and moderators don’t. Depending on an organization’s custom needs for user role specification or other business needs, any number or types of roles can be added to the platform. Also, user access for certain roles can be customized and restricted by viewing time, viewing device, or even viewing domain. E-commerce portal for selling or syndicating medical videos and other digital media: VIDIZMO offers a complete e-commerce video platform that can be used by healthcare institutions to distribute their online video content for selling, rental or subscription. With the e-commerce portal, you simply select the required videos from within VIDIZMO’s healthcare video portal, assign meta details such as price, description, distribution models, etc. and start selling the content within minutes. Our e-commerce video portal enables a smooth shopping experience with a shopping cart system for order completion and logistics management, facilitated by technologies such as advanced hosting, high availability servers, and bandwidth optimization. Website & social media integration and marketing: VIDIZMO allows integration of the healthcare video platform and other digital media content on social media platforms, websites, workplace team collaboration tools like Yammer, and email. This way, video can be shared on other platforms to boost marketing efforts. For instance, patient testimonial videos, an incredibly powerful marketing tool to reach out to new patients, can be emailed directly from the healthcare video platform to new or potential customers to show them what they can expect from an institution and its services. The same video can also be integrated on a facility's website to boost website search engine ranking, or promoted on social media platforms to increase viewer engagement and build customer loyalty. Similar strategies can be used for seasonal campaigns containing flu or virus awareness videos, or ones promoting a healthcare facility’s services. Branded platform with customizable layout, language options, etc. : VIDIZMO offers a white-labelled healthcare video platform, which can be customized to align with an organization’s branding, themes, etc. The platform is also available in a wide range of languages to accommodate a variety of user or business needs. In a cloud-based healthcare video platform that runs natively on Microsoft Azure or Azure Government Cloud, VIDIZMO Health Academy delivers high-quality streaming video to a limitlessly scalable user-base, on any device or bandwidth conditions. Installing VIDIZMO Health Academy in Microsoft Azure Cloud ensures providence of one of industry’s best security and compliance, including Health Insurance Portability and Accountability Act (HIPAA) compliance with media encryption. Alternatively, VIDIZMO is also available for installation on-premises or in hybrid models. VIDIZMO provides native integration with all Microsoft Office 365 business tools and services such as SharePoint, Yammer, Dynamics 365, Skype for Business, Azure CDN, etc., so healthcare facilities can leverage existing Microsoft business tools while launching VIDIZMO’s video streaming and digital asset management capabilities. In alliance with Microsoft, VIDIZMO also utilizes value added feature innovations in Azure Media Services and Azure Cognitive Services, features such as automated transcription, facial recognition, content moderation and auto indexing, among several others on the roadmap, which can be utilized as part of VIDIZMO. For more on VIDIZMO's video streaming capabilities in healthcare, visit our website or contact our team for details.